On Dec. 18th, 2016, CASTF held a Christmas party for the academic and technical talents in Helsinki, Finland. 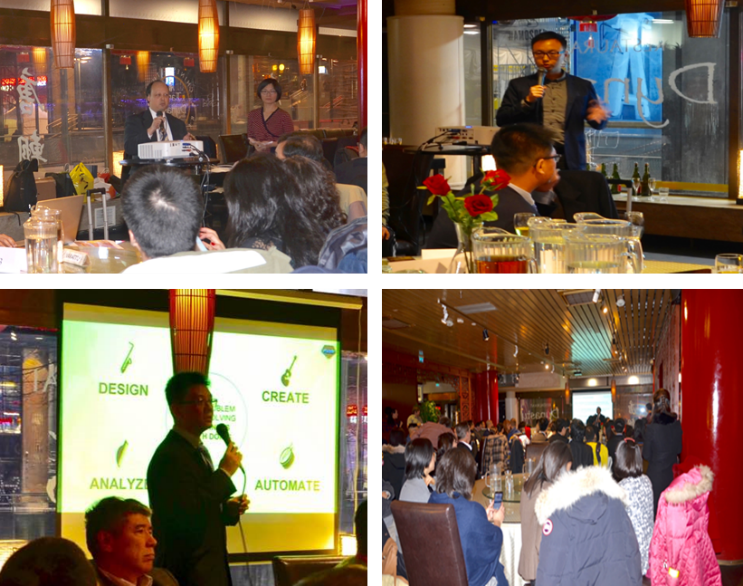 Nearly 100 people attended the party, among which are the representatives from the technology and business industries, leaders and representatives from Chinese Embassy in Finland, Finnish government science and technology service agencies and other associations. 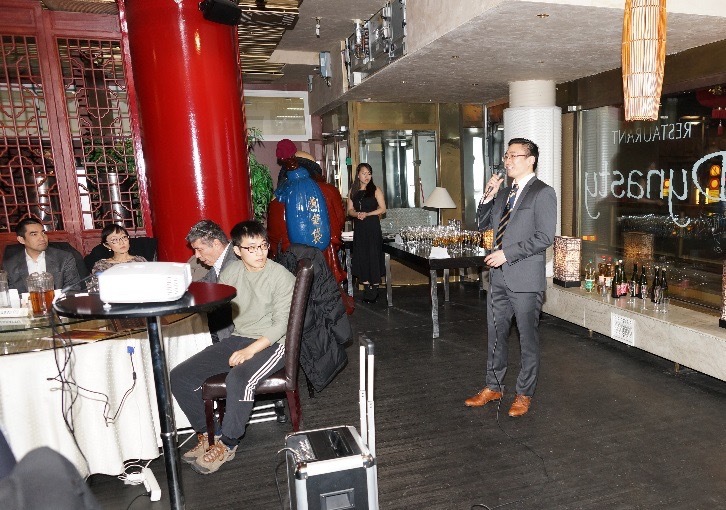 Ambassador Chen Li and his wife Counselor Qin Sa, Consular Department director Li Jian, First Class Secretary in Science and Technology Group Qian Jinqiu, and First Class Secretary in Education Group Gao Yuhang were present and celebrated the coming Christmas and Near Year with others. The meeting was chaired by Ms. Shi-ting Chen, a Chinese business consultant from Finpro. First of all, Dr. Juhua Xu, President of CASTF, briefed Ambassador Chen and the leaders on the development of association between 2015 and 2016 as well as the focus on 2017 schedule. It is planned to hold a Finland-China technology forum from August 8 to 11, 2017, theme on cleanliness and recycling technology. After the end of the report, Ambassador Li Chen made an important speech. Ambassador Chen stressed that Finland is a typical representative of the innovative countries, with the world's leading innovative technology in many fields. Finland owned a strong entrepreneurial atmosphere with an open and efficient innovative environment. Meanwhile, China is also active in the implementation of innovation-driven development strategy, through the "public entrepreneurship, all innovation" to maintain steady economic growth momentum for these two countries and create a common development opportunities. Finland-China technology innovation and cooperation has a promising prospect, wish all the Chinese experts, scholars and Science and technology entrepreneurs in Finland devote themselves to the national innovation-driven development strategy, and CSATF in the future actively build a platform for innovation and entrepreneurship cooperation and plays a vital role in the promotion of Finland-China technology innovation and cooperation. Then, Mr. Michael Haralson, Deputy General Manager of Taiku in Finland, introduced the advantages and related services regarding Finnish Business Incubation Center. 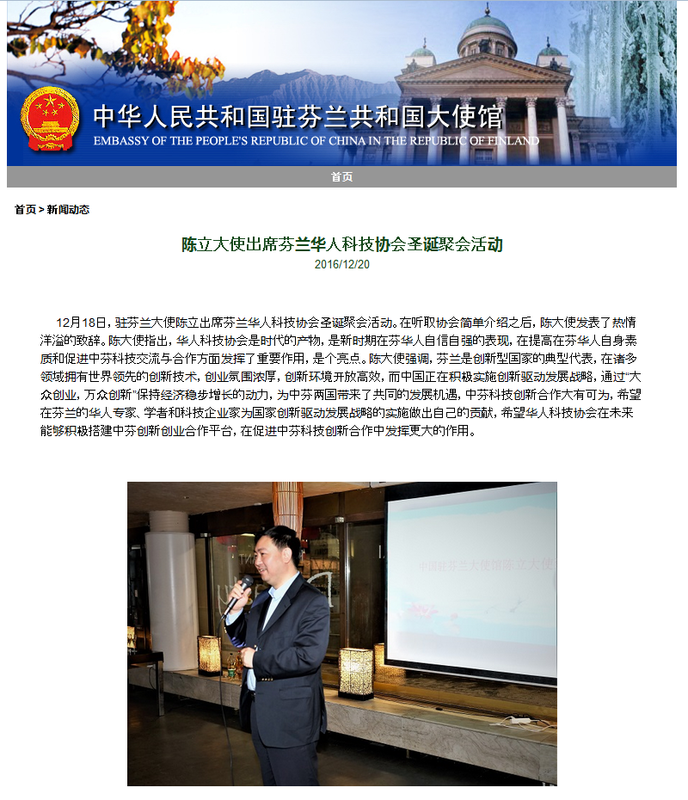 Mr. Xin Wang, Advisor of China Affairs, Regional Economic Development Bureau in Helsinki, made an presentation about cooperation plan of Finland and China for the next five years. 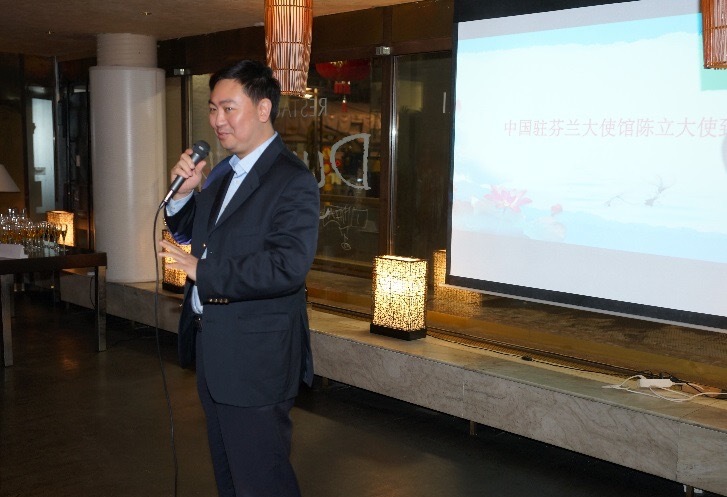 Finally, Dr. Wei Yin, Chief Financial Officer of Finnish Online Payment Leader, presented TCG and cooperation with Alipay. This meeting provided scientific and technological talents a platform for exchange. Importantly, Ambassador Li Chen’s presence and speech further embodied the talents of academia, science and technology, and incubation enterprises and technological innovation enterprises. All the participants said that the activities were lively and profitable with abundant content. 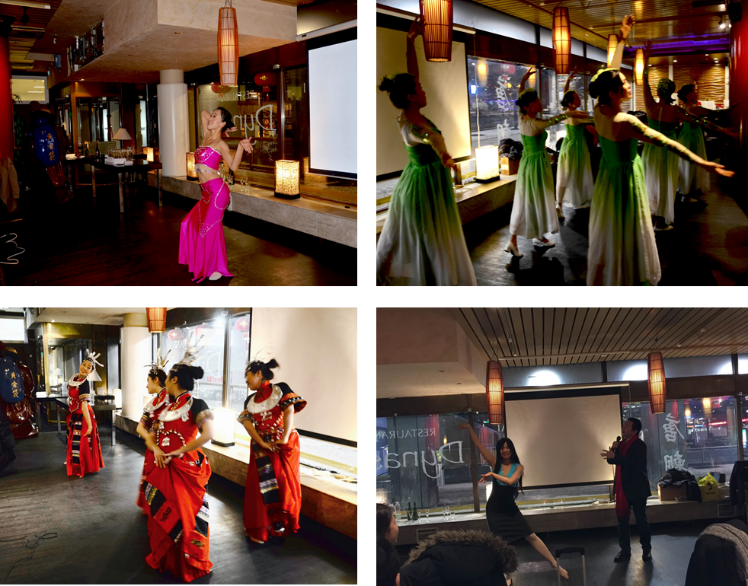 During the dinner, China Suomi Dance, the Flower Dance Team and Finland-China Arts and Crafts Association together presented a wonderful performance for everyone, and the whole party came to an end at the atmosphere of happiness and peace. Thanks to those organizers of this meeting, the Finnish Chinese Entrepreneurs Association and China Association for the Promotion of Peaceful Reunification of Finland support and assistance. 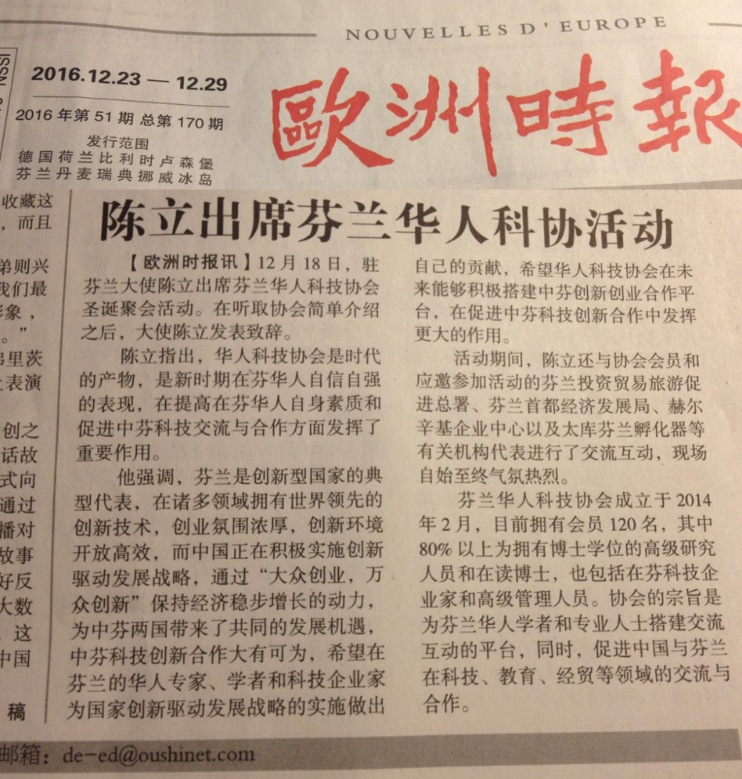 The news of this event was reported by the Chinese Embassy in Finland and the European Times，that 'European Times' is the People's Republic of China News Agency issued on the European content of the Chinese daily. Christmas party was reported by the Chinese Embassy in Finland.